So often life seems to be only a tangle of questions, hard questions at that. Why does the earth quake, killing hundreds with each spasm of dirt and rock? Why do the rains fall, destroying a season's worth of food with each wet shower? Why do planes plummet from the sky, taking hundreds to terrifying and fiery deaths? If God is a God of love, why do I have cancer? If God is all-powerful, why doesn't He keep my spouse from alcohol? Couldn't He have prevented the car accident that took my child's limb? These questions, and endless others like them, lead us to what we have called the great-controversy theme, the great motif of the battle between Christ and Satan that weaves its way through the Bible, from the opening pages to the climax and close. 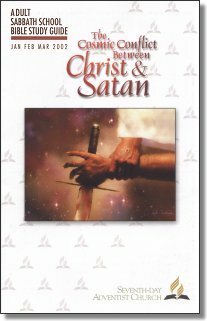 Through captivating stories and inspiring truths, this theme—that of the battle between Christ and Satan, between good and evil—gives us a basic understanding, a basic framework or template, in which we can seek some understanding of these hard questions. The theme provides a worldview of our origin and destiny and the ebb and flow of human history. It also offers an outline, though broad (even coarse at times) of the following: (1) how sin began; (2) why we suffer; (3) how God can be both just and loving; (4) what really happened through Jesus' life and death; (5) the meaning of Jesus' heavenly ministry; (6) how we should relate to God's law, love, grace, and judgment; and (7) how sin will end. "All humanity is now involved in a great controversy between Christ and Satan regarding the character of God, His law, and His sovereignty over the universe. This conflict originated in heaven when a created being, endowed with freedom of choice, in self-exaltation became Satan, God's adversary, and led into rebellion a portion of the angels. He introduced the spirit of rebellion into this world when he led Adam and Eve into sin. This human sin resulted in the distortion of the image of God in humanity, the disordering of the created world, and its eventual devastation at the time of the worldwide flood. Observed by the whole creation, this world became the arena of the universal conflict, out of which the God of love will ultimately be vindicated. "—SDA Church Manual (Hagerstown, Md. : Review and Herald Pub. Assn., 1995, revised edition), p. 9. This quarter we will study the great controversy theme in detail. The lessons do not cover all that we might wish on this topic (What human books could? ); instead, they provide an outline that, while not giving answers to the hard questions, will provide a framework from which we can, at least, glimpse the hope that lies behind them. At 2:30 A.M. on Monday, May 24, 1999, a passenger train, called the Twilight Shoreliner, en route from Boston, Massachusetts, to Newport News, Virginia, struck and killed five people. The dead were Julia Toledo, an Ecuadoran immigrant, and her four sons: Carlos (eleven), Jose (ten), Angel (six), and Pedro (three). An investigation revealed that no one had been at fault. Sure, the mother shouldn't have been on the tracks with her children (they might have all been there by accident, lost), but otherwise, there was no one to blame, no one to charge with a crime, no one to explain why a mother and her four children should get run over so unceremoniously by the Twilight Shoreliner on May 24, 1999. For atheists, this blood on the tracks poses no philosophical problem: We live in a meaningless, senseless world in which mothers and children sometimes get run over by trains. Don't look for meaning because, frankly, there is none. As Seventh-day Adventist Christians, we know that answer is wrong. Because we are beings made in the image of God, our lives, each one, have meaning; thus, by default, our deaths (each one) must, as well. The hard question is not Do they have meaning? but What is it? Ellen White, writing in the context of Lucifer's fall, said that to explain sin would be to excuse it; sin is inexplicable because it is inexcusable (see The Great Controversy, p. 492). Perhaps, then, death, the result of sin, falls into the same category: To explain it would be, in a sense, to excuse, even justify, it, and how can death be justified in a universe created by our loving Lord? It can't. Instead, all we can know, at least for now, is that we are swept up in a battle between good and evil, between Christ and Satan—and that two thousand years ago, at the cross, the decisive victory was won for us. Because of that victory we have the promise that evil and death will be eradicated, that all God's ways will be vindicated before human beings and angels, and that so much of reality that now comes entombed in darkness will one day radiate in the light of God Himself (1 Cor. 4:5), who promises to make all things right. Until then, and beyond that promise, it can be so fruitless to ask Why because there is no Why other than that evil is, that it is part of this world for now, and that, again, to explain it would be excusing it, and the last thing evil needs in this great controversy is to be excused. And it's this theme, that of the great controversy between good and evil, that Dr. John Fowler of the General Conference Education department expounds with great depth and clarity in this quarter's lesson study. And though many questions will remain, this Bible Study Guide-with Christ as the focus—helps us see that the only hope we have in a world with things like the Toledo family's blood on the tracks is. indeed, Christ's blood on the cross. Jerry Giardina of Pecos, Texas, assisted by his wife, Cheryl, prepares a series of helps to accompany the Sabbath School lesson. He includes all related scripture and most EGW quotations. Jerry has chosen the "New King James Version" of the scriptures this quarter. It is used with permission. The study helps are provided in three wordprocessing versions Wordperfect; Microsoft Word; RTF for our MAC friends; and HTML (Web Pages). Editorial Production Manager: Soraya Homayouni Parish. Copyright � 2001 General Conference of Seventh-day Adventist. All Rights Reserved.